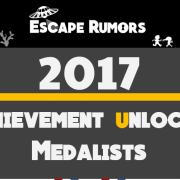 We are honored to share that Epic Team Adventures’ escape room, The Raven and the Red Death, was selected by Escape Rumors as a 2017 “Achievement Unlocked Medalist” for most climactic escape room. Congratulations to room designer Richard Thames Rowan and everyone at Epic Team Adventures who was a part of building and operating The Raven and The Red Death! Escape Rumors’ reviews of The Raven and the Red Death and Quest for Excalibur are here. For anyone who would like to try this room, you may book it here.